If you are interested in visiting a country with impressive historic monuments and stunning natural beauty, read our short Turkey travel recommendations which include Cappadocia, Pamukkale and Ephesus. Cappadocia is located in central Turkey (eastern Anatolia) on a high plateau. 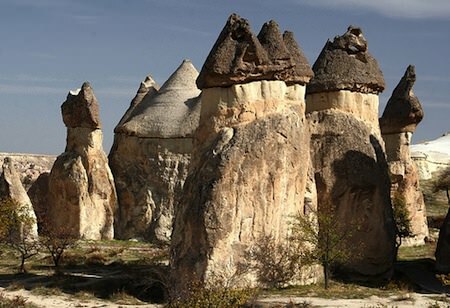 It is famous for the Fairy Chimneys (rock formations that soar like tall towers) nearby Göreme. 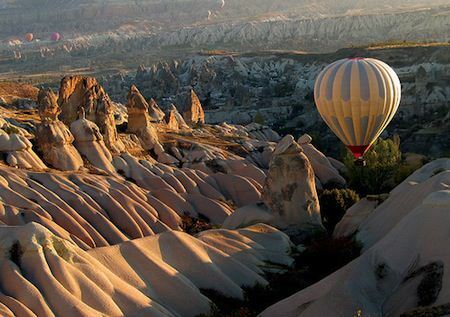 The best way to see these rock formations and caves is from a hot air balloon. Devrent Valley: Devrent is located on the northern slopes of Aktepe; the ruins at Devrent are spread over three valleys. You will see fairy chimneys in this valley. Monks Valley: This is the best place to see three-headed fairy chimneys as well as the Pasabag (Pasha’s Vineyard) which is ringed by rock formations. Göreme Open Air Museum: This is the most visited site in Cappadocia. You will see painted cave churches that had been decorated by medieval monks. Uchisar: Uchisar is named after the enormous rock (with caves) in the center of the town. It is the highest peak in the area and from here, you can see all of Cappadocia and Mount Erciyes. Kizilcukur: an isolated valley behind Urgup which has beautiful rock formations with hidden rock-carved churches. Cavusin: Next to Goreme, it is the site of the Church of St. John the Baptist, which dates back to the 5th century. Hospital Monastery: Carved into the rock, this is one of the oldest monastries in Cappadocia. Kaymakli: Kaymakli and Derinkuyu are two of the largest and deepest underground cities in Cappadocia. Not all levels are open to the public. 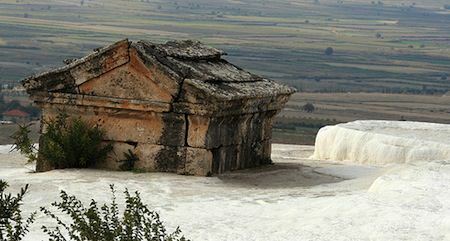 Pamukkale means “cotton castle” in Turkish. 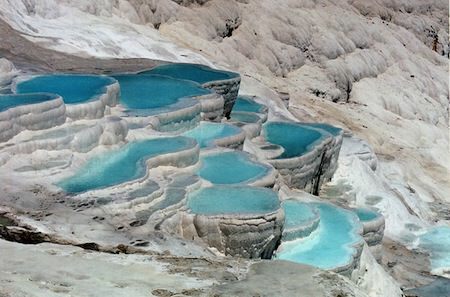 It is the site of hot springs and terraces of carbonate minerals deposited by flowing water over the centuries. It is also the site of the ancient city of Hierapolis whose tombs and edifices you can still see partly submerged in the terraces. Ephesus is an ancient Greek city. In the first century BC (under Roman rule) it was one of the largest cities in the Mediterranean with a population of 250,000. It is best known for the Temple of Artemis (built in 550 BC), one of the seven wonders of the ancient world, but sadly the temple has been almost completely destroyed. 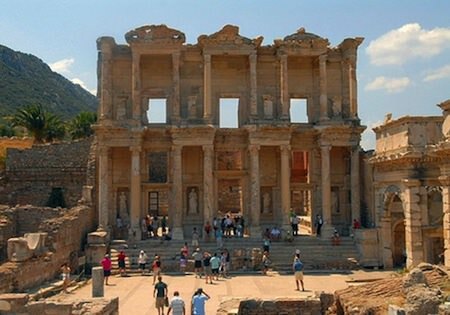 Today one can visit the following preserved sites in Ephesus: Library of Celsus, Gate of Augustus, Basilica of St. John, the Odeon, the Temple of Hadrian and the Temple of Domitian. Ephesus is considered to be the best preserved ancient Greek city. It is one of the most important early Christian cities. St. Paul lived and preached there. It is mentioned in the Book of Revelation. I would like to thank Ugur Ilgar for providing this list of must-see places in Turkey. Ugur is the founder of LuxuryIstanbul, a Turkey travel specialist and tour company that organizes tailor-made holidays and special tours (shopping, history, archaeology, art and more). His firm can create an itinerary for you in Cappadocia, Pamukkale, Ephesus, Istanbul and other parts of Turkey. If you are going to Istanbul, check out all our articles about Istanbul (hotel and restaurant recommendations, places to visit, hammams and more). Great information.These are the must see attractions in the Turkey.What i really liked is Pamukkale You have stated the brief details with the images.Thanks for the great article. Congratulations for choosing the perfect photos of the Turkey highlights and thank you for sharing great itinerary with Mapplr’s esteemed visitors. I believe this will be an important guide for those distinguished travellers who wish to travel Turkey. Whether you are looking for a distinctive journey with an extensive selection of travel destinations and travel choices or “for those who are on a business trip in Istanbul” looking for a way to find style and comfort around every corner, then you are stumbling upon a website that you are looking for.